Are you having a problem with dog waste management at your park or campground? Don't get left holding the bag, our Dogipot Junior's TM Green Polyethylene Pet Waste Station helps remind dog owners of their responsibility to pick up their dog waste while providing the bags to make cleanup easy. Dogipot Junior dog waste bag dispenser is made of 2mm ABS. The new and improved Dogipot Junior has smaller diamond-shape pet bag dispenser openings to create more resistance to the bag/roll when pulling and tearing off the next bag from the roll. Dimensions: 17" x 10" x 3". Designed to mount on 2" x 2" poly or steel square or channel post (mounting hardware included). Dogipot Jr can be fence, wall, wood post and channel post mounted also (fence, wall and wood post mounting hardware not included). 1. Remove the two keys from the back of the Dispenser. Insert key into the universal cam lock on the bottom compartment and turn one quarter to the right or left. Pull the bottom compartment down to release it from the body of the Dispenser. 2. Select a good visible spot in your community or park where you want to install the DOGIPOT Jr. Bag Dispenser, such as on a post, building wall, tree, fence post, street sign post, etc. 3. The Dispenser has two pre-drilled holes through the back wall. These two holes and the mounting hardware included match with the holes of every standard channel or square telescopic mounting post. 4. The recommended installation height of the DOGIPOT Jr. Bag Dispenser is 66" (5 feet 6 inches). 5. To refill the DOGIPOT Jr. Bag Dispenser with DOGIPOT Litter Pick Up Bags, take two (2) boxed rolls, and tear off the perforated seal from each box. Place the two boxes on top of each other on the bottom compartment shelf with the opening of the boxes facing the front. Reinstall the bottom compartment and lock the panel with the cam lock key. 6. Reach through the two diamond-shaped openings and find the raw edge of the first bag through each of the slots and pull until the DOGIPOT logo is visible. 7. ENJOY WATCHING PET OWNERS PICK AFTER THEIR DOGS! 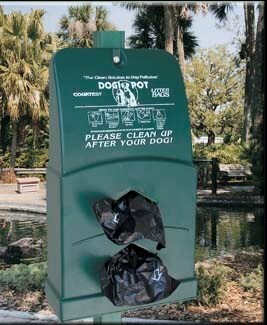 Go to top of this Dogipot Junior Poly Dog Waste/Pet Waste Bag Dispenser 1007-2 page.